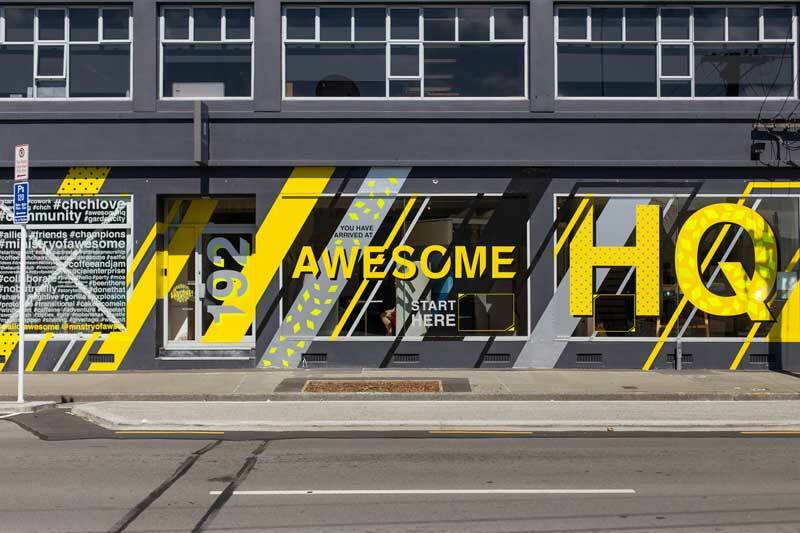 “Crazy, cool, wow and eye-catching” was the brief Team Tanks got from the Awesomologists at Ministry of Awesome when their Christchurch CBD building needed a facelift. Now that’s our kind of brief! A radical team of start-up activators, event organisers and co-working space sharers, the folks at Ministry of Awesome provide a place to grow ideas and bond with like-minded souls. Their work is all about promoting a culture of inclusion, positivity, and progress to help people follow their passions and create a thriving, connected, and activated city. They invite entrepreneurs to speak about their ideas, then provide them with the relevant info and connections to realise their potential business or project. They encourage businesses and individuals to join their co-working space, whether for a day or long term, not just for convenience but also social dynamic. Their ideology around bringing people together comes from their love of Christchurch and their passion for re-energising local people and places. They wanted this ethos reflected on the outside of the St Asaph Street Awesome HQ office. We took the rebuild zone as our inspiration: roadworks, hi-vis, juxtaposition of old and new, organic and inorganic. This is the contemporary, visual vernacular of our city, so why not embrace it? This informed our look, colour and material choices. Hi-vis, retroreflective and metallic vinyls signal where it’s all happening. Graphics are dynamic and punchy. Whether you’re driving past at 50 km/h or taking an inner city stroll, there’s different levels of information to soak up. The more you look, the more you see. Awesome HQ came up with their favourite hashtags which they encourage people to use when referring to them on social media. We used ‘Start Here’ and ‘Take a Peek’ to inspire passers by to take a closer look and visit the Awesome exhibition spaces inside which showcase current projects in unique ways. While attracting attention on the street level, clever placement of the graphics also creates privacy for those at work in the office or meeting rooms. To achieve the vision, we worked with the amazing team at Action Signs who executed the installation perfectly. Not A Day Wasted Pictures was there to capture it. Check out the time lapse below which was filmed over four days and contains some epic drone footage! Want us to awesomify your window or shopfront with outstanding environmental graphics? Get in touch. Battered Women’s Trust Re-Brand Tanker has Moved Office!